“Bomb cyclone.” Two words. Neither good, separately. Together, disastrous. Meteorologists used the term “bomb cyclone” to describe a massive storm that swept west-to-east across the U.S. in mid-March. The late-winter event, which included hurricane-force winds, left in its wake millions of tons of snow and rain that inundated more than a dozen states, stranded tens of thousands of airline passengers, and forced hundreds of vehicles off the roads. In one of those, a couple and their two young children from Kansas City, Kansas, clung to a diminishing hope for rescue as darkness descended, snow accumulated around their SUV, and their fuel gauge crept toward E.
During a brief respite from the blizzard, Branden Heater follows father-in-law Jerl McKinney. Even the usual rescuers were overmatched. The National Guard was stymied by the high winds and snowdrifts. And the nearest fire department couldn’t help, either — they’d sent out trucks, but recalled them due to impassable roads. Almost out of desperation, the sheriff’s department posted the family’s predicament on social media. Which is where Jerl McKinney’s daughter learned about it. “Kelly heard about the family on social media and wanted me to help them,” recalled McKinney, who is a senior business services sales trainer for Comcast. If anyone could help, he could. When he was in the Coast Guard, stationed in Portsmouth, Virginia, he’d been a member of a search and rescue unit and was one of its two designated rescue swimmers. The Coast Guard motto is Semper Paratus, always ready. If he hadn’t been when the bomb cyclone struck, this story might’ve ended differently. About seven years ago, McKinney and his family traded their suburban home for a ranch near remote Kiowa, Colorado, about 50 miles southeast of Denver. 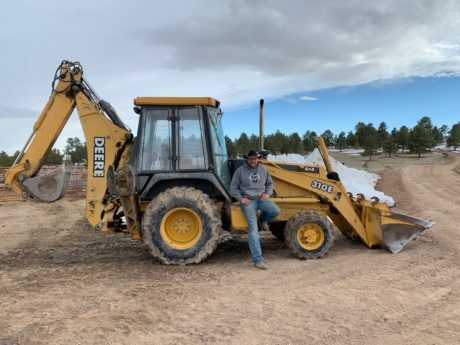 And because McKinney is a full-time rancher — ranching is full-time work, regardless whether you have another full-time job — in a sometimes hostile environment, he’s equipped. “I have a John Deere 5075 (compact tractor) with a 6-foot blade and a 6-foot bucket,” said McKinney. Yachtsmen say that open-water sailing in the Southern Ocean is like trying to balance on a beach ball while fully clothed under an ice-cold shower. This was worse. But even though McKinney’s tractor has no cab, no enclosed compartment to protect the driver from the elements, he bundled up and hit the road. Branden Heater, Kelly’s husband, followed in his pickup truck. The visibility was so bad, McKinney used a flashlight pointed straight down to see whether he was still on the road. 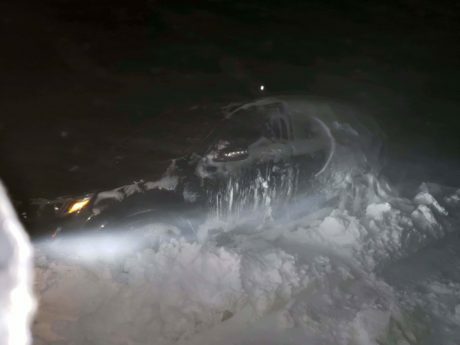 Browning and Dullea's SUV was nearly buried by the time their rescuers arrived. Miles away, in a vehicle steadily being entombed by snow, Shelby Browning was playing games to distract her 7-year-old son and 20-month-old daughter. Meanwhile, her husband David Dullea was trying to keep the snow clear of their SUV’s exhaust pipe so they could continue to run the engine to generate heat. They’d been stuck since noon, and now it’d already been dark for several hours. According to the sheriff’s department, the stranded family was at the intersection of Highway 86 and Freeze Road. Since McKinney’s half-mile driveway ends at that intersection, he thought he and Heater would find the SUV buried nearby. But when they arrived, they could see no vehicles. Luckily — and nearly every detail of this story could begin with the word “luckily” — Kelly was on the phone with Dullea and instructed him to turn on his Find My iPhone app. This allowed Kelly to pinpoint Dullea’s location, which was actually about seven miles away, and pass that information along to her husband and McKinney. 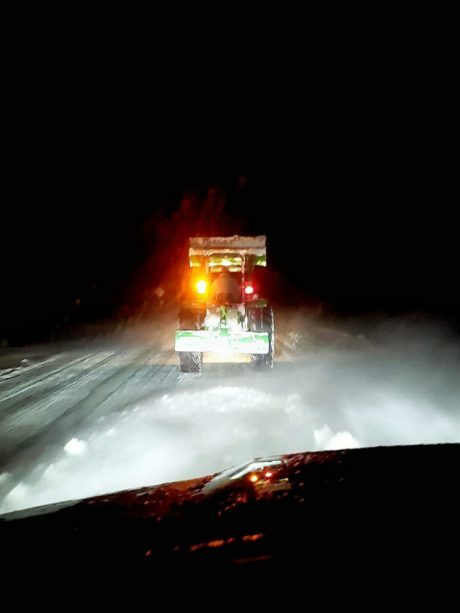 Seven miles on a tractor can be pretty slow going, especially when fighting a blizzard and steady winds topping 70 miles per hour. Just two miles into the trip, McKinney and Heater spotted a pickup truck in a ditch. 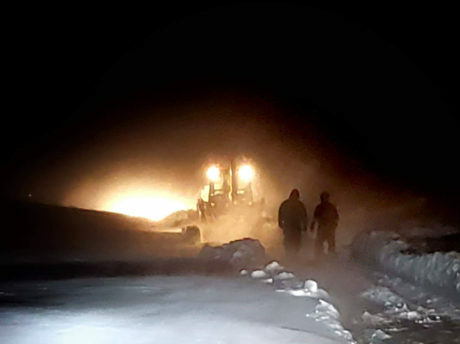 Jerl McKinney and his son-in-law Branden Heater follow on foot as John Miller's tractor smashes through drifts over 5 feet high in some places. Like McKinney and Heater, Josh Polk had ventured into the storm to help the stranded family, but he soon found himself in similar straits. McKinney and Heater pulled Polk’s pickup truck back onto the road. Now that they understood what they were up against, the three returned to McKinney’s home to regroup and plan. McKinney, Heater, and Polk grabbed some essentials, including tire chains. McKinney — who, remember, was exposed to the weather on his tractor — borrowed Polk’s ski goggles. After setting out again — McKinney on his tractor, followed by Heater and Polk in their pickup trucks — they were soon joined by neighbor John Miller, who was driving his John Deere 310E construction tractor. The others followed Miller, whose 8-foot blade cut a swath through snowdrifts that in places were a couple feet taller than he is. By 2 a.m., the team had clawed its way to within 100 yards of the marooned SUV. “I can’t describe the elation when we saw those headlights come over the hill,” Dullea recalled. “It was a huge, huge moment for all of us in the car.” He began frantically flashing his headlights. 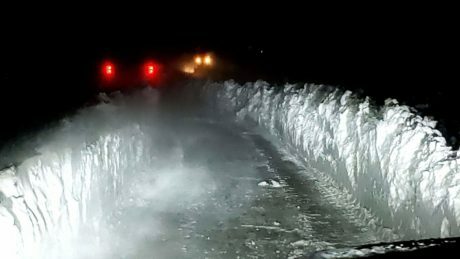 Those last 100 yards were covered by an uninterrupted snowdrift more than 5 feet high, but Miller’s tractor cut through it, and McKinney and Heater followed on foot. When they reached the SUV, Dullea sprang out and gave everyone a hug. He and his family had been trapped for more than 12 hours. Polk offered his house as a refuge for the family. They gathered a few belongings and then locked the SUV. When McKinney asked what he could carry, Browning handed him her daughter. Doubling back on their own tracks, Miller, McKinney, and Heater rescued other stranded motorists. The caravan, which now comprised two tractors, two pickup trucks, and seven people, set out toward Polk’s house with Miller in the lead again. Even though McKinney, Heater, Polk, and Miller already had done what they’d all set out to do, their night still wasn’t over. On the way to Polk’s house to drop off the family, the men pulled two more stranded vehicles from snowdrifts, rescuing three more people and a German Shepherd. When the family arrived at Polk’s house, they found that Landon, Polk’s son, had cooked a hot meal for them. The menu? Approximately what any 10-year-old boy would dream up at 2:30 a.m. — macaroni, pigs in a blanket (a regional “comfort food” made of sausage wrapped in pastry), chicken strips, pretzels, and, for nutritional balance, popcorn. When McKinney made it back to his own driveway, closer to dawn than midnight, he needed three passes in his tractor to get up to the house. John Miller with his John Deere 310E tractor in less snowy times. In this part of the country, there’s usually finger-pointing only when credit is being handed out, and each of the rescuers — Polk, Miller, McKinney, his daughter Kelly, and her husband Branden — insisted one of the others deserves most of the credit. And Dullea and Browning and their two young children? They’re now safe and sound and immeasurably grateful to the four men who’d risked their own safety to ensure theirs. If you enjoyed reading this story, check out other stories below featuring John Deere customers and employee volunteers who have made a positive impact in their local communities.